Federal net neutrality regulations went away Monday, but internet users across the country may not notice any immediate changes. In Washington, a new state law says they shouldn’t, period. The Federal Communications Commission’s decision last year to end certain rules designed to guarantee equal access to the internet was greeted by outrage from some tech companies, which service providers attempted to counter with assurances that nothing would change other than the unnecessary burdens of federal regulations. A lawsuit from Washington and 21 other states is seeking to block the FCC’s decision, and Congress is considering legislation that would put the old rules into federal statutes. The Senate has passed a net neutrality bill, but the House hasn’t yet. The Washington Legislature did, with Gov. Jay Inslee signing the nation’s first state net neutrality law on March 5; it took effect last week. Oregon passed its own law and California is debating one. Governors in some other states have taken executive action to set up similar rules. What is net neutrality, anyway? : It’s a policy that essentially says internet service providers, the telecommunications companies that provide people and businesses with a way onto the internet, can’t play favorites. They can’t provide slower speeds for some websites and faster speeds for others, which would have the effect of giving companies operating those faster websites an advantage. It also means they can’t block lawful sites or slow down lawful internet traffic. Who could be against that? : Some providers, known as ISPs, said they weren’t against the concept, but didn’t think it should be the province of FCC regulations. They said the regulations weren’t necessary, could restrict expansion of faster internet to underserved areas, and that consumers could be protected by the Federal Trade Commission. Why does it seem like I’ve been hearing about this forever? : The FCC first proposed eliminating its regulations in April 2017, but it had to follow the lengthy hearing process for changing a federal regulation, then vote to make the actual change. The vote occurred last December, with the three Republicans voting yes and the two Democrats voting no, but it didn’t take effect until Monday. What steps did Washington state officials take? : In December, Inslee issued an executive order threatening state sanctions against any ISP that limited access or selectively slowed service, which included consumer protection actions, loss of state contracts or asking the Washington Utilities and Transportation Commission to deny access to utility poles. Attorney General Bob Ferguson joined Democratic counterparts from other states in filing a lawsuit, which is pending. What did the Legislature do? : In the 2018 session, it debated and ultimately passed a bill that placed the old FCC standards on ISPs operating in Washington. Violations would be enforced under the state’s Consumer Protection Act. The bill received bipartisan support, but not unanimous support. Opponents argued the state should let Congress enact nationwide net neutrality laws to avoid a patchwork of rules across states and a legal fight with the federal government because the FCC regulations bar state laws that go against federal actions. 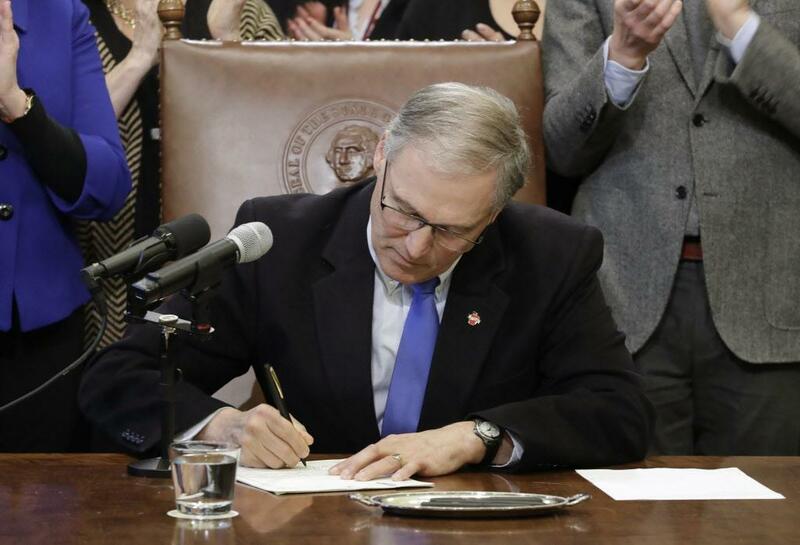 In signing the law in March, Inslee said he was confident of the state’s legal position. What’s next? : Congress would have to act by later this month to block the FCC decision with a law, but Republicans could delay a vote on the Senate bill until that deadline passes. The state lawsuits were consolidated and are in front of the U.S. Court of Appeals in Washington, D.C., but haven’t been scheduled for a hearing. Published: June 12, 2018, 6 a.m.